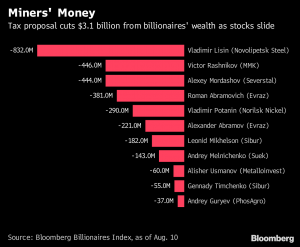 (Bloomberg) — Russia’s super-rich tycoons lost more than $3 billion in one day after a top economic aide to the president proposed raising taxes on the nation’s giant metal and mining companies. In a letter to Vladimir Putin, aide Andrey Belousov named 14 companies that could pay more. The resulting investor exodus saw $3.1 billion wiped off the fortunes of their affluent bosses, according to the Bloomberg Billionaires Index. The companies that would be affected by the plan include MMC Norilsk Nickel PJSC, co-owned by tycoon Vladimir Potanin; Severstal PJSC, where magnate Alexey Mordashov is the largest shareholder; and petrochemical group Sibur Holding PJSC, controlled by Leonid Mikhelson and Gennady Timchenko. The proposal could raise as much as 500 billion rubles ($7.5 billion) a year to help fund Putin’s spending plans, according to Belousov’s letter, obtained by Bloomberg News. It would also affect chemical and fertilizer producers. Lisin lost the most among the affected billionaires as Novolipetsk Steel slumped 5.4 percent in Moscow trading on Friday. His $832 million loss equates to about 4 percent of his net worth, according to the billionaires index. Viktor Rashnikov, owner of Magnitogorsk Iron & Steel Works PJSC, was the second-biggest loser as his company dropped 5.2 percent. It’s not the first wealth decline which Russia’s richest people passed through last week. On Wednesday, the U.S. announced new sanctions on Russia over nerve-agent attack on former double agent Sergei Skripal and his daughter in the U.K. that caused ruble and stocks slump. The Bloomberg Billionaires Index tracks the wealth of the world’s top 500 richest people.